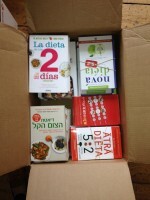 Fast diet book arrived today… All in imperial! This topic contains 1 reply, has 2 voices, and was last updated by fasting_me 1 year, 7 months ago. Slightly disappointed that my fast life book I ordered online isn’t in metric.I just assumed it would be when dr Mosley is British. To be honest having to calculate the metric for every recipe won’t help my motivation. Do you have any books in metric? Send it back and get another one…? Actually, after reading the recipes in the book and using them, I found myself stymied by general terms such as ‘medium cucumber’ or 1 bell pepper. Now I use a kitchen scale and mass everything out.